This fully-animated video contains two fun, heartwarming adventures--"Gigi's First Day of School" and "Gigi's Fishing Hole." Fully-animated video with two fun, heartwarming adventures. Gigi's First Day of School: Hard to believe, but the ever-confident Gigi is actually nervous about starting first grade. She's heard some rumors from the neighbor kids about the teacher and isn't sure school is for her. Join Tiara, Fluffy and Frances for a wild ride thru Gigi's over-active imagination on her way to growing up. Gigi's Fishing Hole: Lake Popplepopper is a glorified pond near Gigi's house. Naturally, Gigi has taken it upon herself to free all the fish living there. But when she and Frances come to finish the task, it seems that mean Mr. Spooner has foiled their plans. Gigi is convinced that this injustice shall not stand. Find out how this roiling conflict was prevented from becoming an all-out feud. 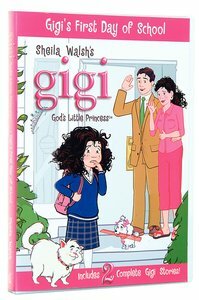 About "Gigi's First Day of School (Gigi, God's Little Princess Series)"
Two fully animated stories and one fun sing-along song. "The Royal Pink Circus: " Gigi and Frances are both excited to go see the traveling circus. They've heard that it is the only circus in the world with princess tightrope walkers and pink tigers. Well, that last part may or may not have been accurate. The girls learn that getting everything 'right' is not as important as showing love and caring for our friends. "The Princess Hair 'Do": Gigi sees a TV special about a princess from another country who has short hair and decides that getting her hair cut short will make her both gorgeous and more princess-y. Ever get a haircut you weren't happy with? In the end, Gigi learns that beauty is only skin-deep and that, no matter what, she is still a princess in God's eyes.